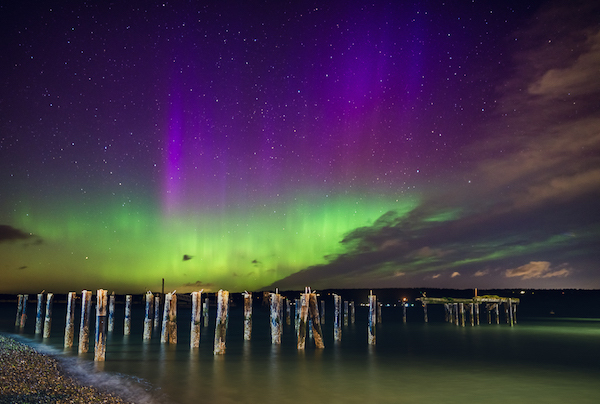 Remember the extraordinary Northern Lights on Whidbey Island last Mother’s Day? Well, Holly Davison—a self-proclaimed science weather geek and star chaser—was outside that night, capturing the colors painted by Nature between midnight and the early morning hours. 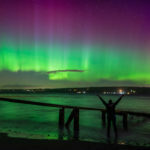 “During Mother’s Day we had one of the biggest solar storms we’ve had in a while,” said Davison, who reads solar storm forecasts the way many of us read weather reports. Solar storms occur frequently, but not always with the same results; another solar storm occurred on July 20, but the full moon cancelled out the color that would have normally appeared. Spending time with the Milky Way and the Aurora Borealis, Davison said, opens a gateway to her soul. 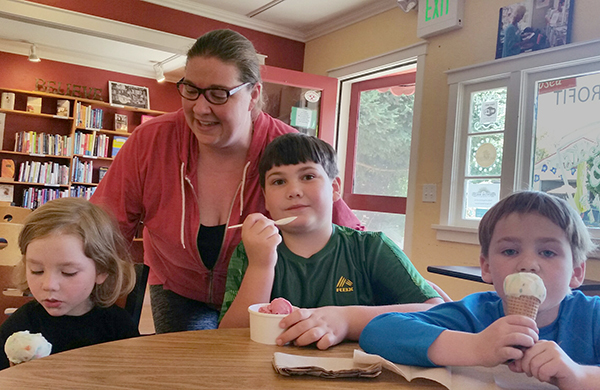 In the midst of raising and home-schooling three active and curious boys who are eight, six and three, she heeds the calling of the night sky when her husband, Brent, is home sleeping with the boys. Sometimes Brent is called to volunteer for his local fire department and Holly is called home from her time with the evening stars. Other times she’ll pile her brood in the camper and head out to see the glories of the Milky Way at Mt. Baker. Davison’s love of the natural world began at age four when her parents moved to Whidbey Island. She recalls family camping trips to the La Push and the Hoh River on the Olympic Peninsula and Mt. Baker in the Cascade Mountains. After graduating from South Whidbey High, Davison found work with the National Forest Service on a trail maintenance crew on Mt. Baker. One of her most memorable events, she said, was her eight-day trek to the High Divide between Mt. Baker and the Canadian border to clear a portion of the Welcome Pass trail blocked by an avalanche. Nowadays when she hikes Welcome Pass at Mt. Baker, she gives thanks to July, the trusted mule, and recalls the spirit of adventure that infused her at the age of 19. Davison took another adventurous leap when she earned a Special Education teaching degree and ran a contained-learning classroom for elementary school students who lived with various challenges, from behavior disorders to autism. In a contained-learning classroom, students with special needs are taught according to their particular learning style. Davison said she also coached mainstream teachers on how to best work with her students. Teaching brought out her inner actor, she recalled, requiring her to deliver her best performance, day after day, to a challenging audience. After teaching in Mukilteo for almost 10 years, Davison married Brent, who works at Boeing and is a volunteer EMT in Clinton. When her sons began to arrive, she decided to devote her attention to being a mom. Looking for outlets to channel her creative energy took her to the photography of Eddie Murdock, who captures, among other things, the night sky. “It snowballed,” Davison recalled. 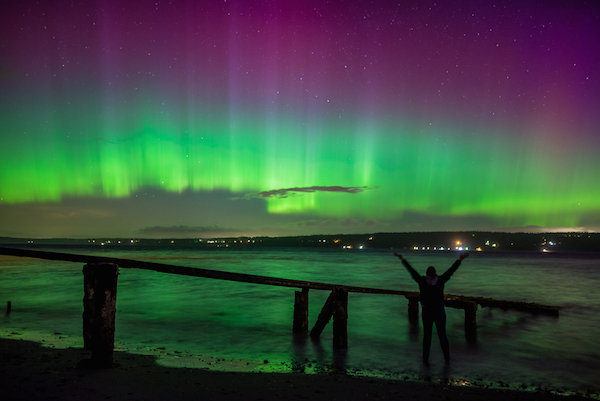 “I saw his photos and was awestruck; I reached out to him and now I help manage his Facebook page about Northern Lights.” She is hooked, she said, on the awe she feels looking at the heavens and now wants to share that feeling through her photos. As Davison immersed herself in photographing the night sky’s moods, she learned about the International Dark Sky Association. The worldwide organization advocates for the reduction of light pollution and seeks to spread the word about the necessity of night skies for the health of sentient beings. The group also lists interactive maps that show the places on Earth with the least light pollution. In Washington State, for instance, they’ve determined that the best place for seeing stars is located in south-central Washington in the small community of Goldendale. 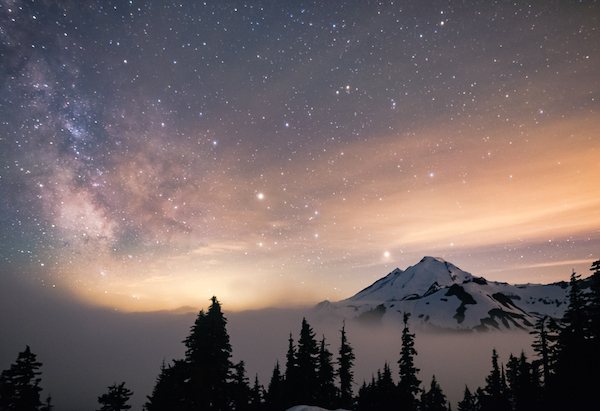 Taking heed of the IDSA’s information, cities and counties throughout Washington State have adapted ordinances to reduce light pollution. Island County Planning passed a light pollution ordinance in 2005, which specifically targets vapor lights that shine directly upward. Overly bright lights are banned as well. 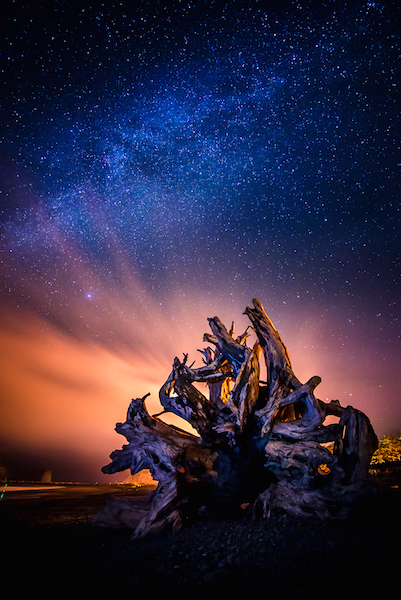 The Planning Department has published a brochure: “Working Together to Preserve Rural Character and the Night Sky,” which is available at the County Planning Department and through the Island County Astronomical Society of Washington. Click here for further information on preserving night sky viewing. Thompson acknowledges that a lot of people have not learned about light pollution. “They go to bed, they go to work,” he said. “They don’t think about how light pollution has grown.” His mission is to raise awareness about viewing the night sky. To that end, he’s spoken at astronomy societies throughout the state. He suggested watching the film, “City Dark,” (available as a free-streaming video through Sno-Isle Libraries: http://sno-isle.org/.) Among other things, the film points out how light pollution affects animals and their ability to navigate. Birds, for instance, get lost in cities because they use the stars to navigate and are confused by city lights. Sea turtles, born in the sand, rely on the reflection of stars in the water to guide them to the ocean, but the glow of city lights now leads them in the wrong direction. Meanwhile, if our clouds part in early August, we should get to see an extraordinary show of meteor showers, known as the Perseids. Thompson estimates there are about 60 meteors falling per hour then but, in light-polluted areas, only the brightest will be seen. These days he likes to take his telescope out to a farm in Coupeville to maximize the darkness. He also visits Sunnyside Cemetery in Coupeville with his star charts to view beloved galaxies, star cluster and nebulas—111 heavenly bodies that were identified by earlier astronomers. He enjoys star parties and advocates giving the winter night skies a look. Winter star gazing isn’t Davison’s cup of tea, however; she considers herself a “sweatshirt and flip-flops kind of gal.” Plus, she said, it’s too cold to go car camping with the boys when the outside temperature drops. 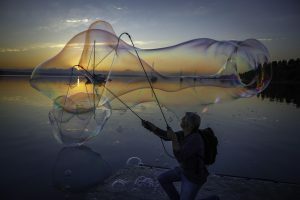 Davison uses a Nikon D60010 and processes the raw images into the ones shown on her website: and Facebook page. Some of her favorite places to shoot are the Clinton ferry dock and Langley Marina. Her delight in what she does can be contagious; instead of watching TV tonight, consider stepping outside and looking at the sky. Kate Poss worked as a library assistant at the Langley Library and retired in May of this year. She was thrilled to work for three summers as a chef aboard a small Alaskan tour boat from 2008 to 2010. She worked as a newspaper reporter in Los Angeles for many years before moving to Whidbey Island where she enjoys ‘talking story,’ hiking, cooking, hosting salons and writing her novel. Holly’s photographic talent is not limited to the night sky-her landscape and wildlife images are captivating. 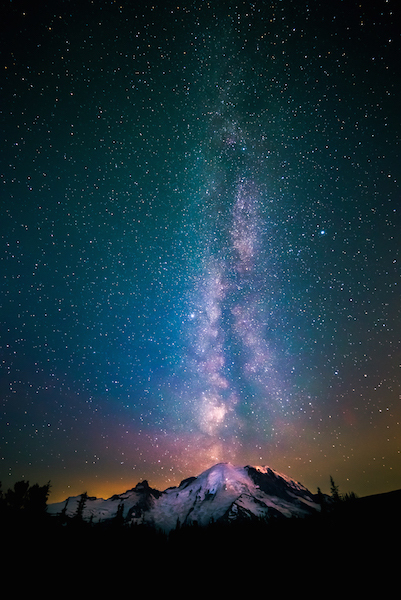 She likely was very modest when interviewed for this story, and forgot to tell Kate Poss that “Milky Way at Mount Rainier” won the Best of Show Ribbon at last year’s Whidbey Island Area Fair. She graciously shared her techniques with the curious.